This 14 night amazing Coastline Tour is a comprehensive driving tour that travels the coastline of Ireland. Spend your honeymoon in Ireland and experience everything that the beautiful Irish coast has to offer on our amazing coastline tour. This driving tour will allow you to visit Ireland’s major attractions in both the Northern and Southern territories. 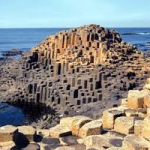 The itinerary includes attractions such as The Giants Causeway, Carrick-a-Rede Rope Bridge , Guinness Storehouse, Cliffs of Moher, Ring of Kerry , Dingle Peninsula and many many more! Whilst travelling make sure to bring your camera to capture the amazing, captivating coastline of Ireland. Not looking for a holiday to Ireland? Check out Let’s go Travel and Limerick Travel for options to other destinations! Guinness Storehouse: The new Guinness Experience is located in the heart of the Guinness brewery in Dublin. It is a dramatic story that begins over 250 years ago and ends in Gravity, the sky bar, with a complimentary pint of Guinness and an astonishing view of Dublin. As you wander up through Guinness Storehouse, you’ll discover what goes into making the Black Stuff- the ingredients, the process, the passion. It was named Europe’s leading tourist attraction in 2015 and has been nominated again in 2016. No amazing coastline tour in Ireland is complete without it. Enroute to the Antrim coast , we recommend that you take a tour of the Boyne Valley in North Dublin. The Boyne Valley and its surroundings, situated some 20 miles north-west from Dublin, is one of the most important Irish locations as far as historical heritage is concerned, from pre-celtic to medieval times. In this area you can find the pre-celtic tumula of Newgrange, Knowth and Dowth, the Hill of Tara, where the ancient Irish kings settled their kingdom (actually, there is not much to see in Tara nowadays, but the site is inspiring), Monasterboice with its High Crosses, the Mellifont Abbey, and many other interesting things. Take the N2 heading north via Ashbourne towards Slane in Co. Meath. Turn right about 2km south of Slane, the Brú na Bóinne Visitor Centre is 7km (4.5 miles) east towards the village of Donore. For about 3km before the Visitor Centre the road follows the bend in the river Boyne. Brú na Bóinne Visitor Centre, open in 1997, is designed to present the archaeological heritage of the Boyne Valley, which includes the megalithic passage tombs of Newgrange and Knowth. The Centre is the starting point for all visits to both monuments, and contains extensive interpretative displays and viewing areas.Please note that this is a very busy site and visitors must expect a delay in the summer months if visiting Newgrange and Knowth and access is not guaranteed. From here, travel to the Giant’s Causeway. At one time this was considered to be one of the wonders of the world. This was due to the fact that the Causeway was formed 70,000,000 years ago by massive volcanic activity is contradicted only by local legend. Clearly this was giants’ work and, more particularly, the work of the giant Finn McCool, the Ulster warrior and commander of the King of Ireland’s armies. After the Causeway, travel to the nearby Dunluce Castle. This spectacular castle was shaped when the sea cut deep into the land, exploiting cracks in either side of the rock. The early Christians and the Vikings were drawn to this romantic place and an early Irish fort once stood here. The direct route from here to Derry will take just over an hour although you may wish to take a side trip to the Ulster-American Folk Park in Omagh, County Tyrone. The museum tells the story of emigration from Ulster to America in the 18th & 19th centuries. A guided walking tour with one of the well-informed and good-humoured tour guides is a must. The city’s history is so complex and its present is so dynamic that it takes a local expert to explain it all entertainingly. The Walls of Derry are among the best preserved city fortifications in the Western World. They rise to a height of 26ft (8m) and in places are 30ft (9m) wide. Completed in 1618 to defend the Plantation City, the walls have never been breached in three major sieges – even during the 105 day siege of 1689 when 7,000 of the 30,000 population died of starvation. Letterkenny, County Donegal’s largest town, has a vibrant atmosphere. It’s a great place to shop for everything from high street fashions to quality handcrafted goods and designer clothes – alternately, you can relax and enjoy a coffee in one of Letterkenny’s many continental-style cafes. Seaside resorts like Bundoran provide a change of mood – if you’re looking for lively nights filled with music, song and dance, then Bundoran is the place to go. Why not take some time out to explore Donegal with a trip to Glenveagh National Park . It covers almost 10,000 hectares of mountains, lakes, glens and woods. The park was opened in 1986 and boasts beautiful lakes amidst breathtaking mountain scenery. For more than 137 years the little village of Belleek has been famous for its distinctive parian china. Today, as ever, Belleek holds a special place in the hearts of china collectors the world over. A trip to Belleek Pottery Visitors Centre is like a step back in time and offers a fascinating insight into this most historic pottery. Travel into Enniskillen in the County of Fermanagh. Fermanagh is a paradise for fishing, cruising and other water based holidays. The largest lake – Lough Erne is 50 miles long and some of the best monastic sites in the area are located on the islands of the lake from Enniskillen. Drumcliffe a small settlement under the mighty table mountain Ben Bulben – in a small churchyard here lies the grave of the famous poet, William Butler Yeats. Yeats was born here and returned often in his lifetime. Sligo is the county town and the largest town in the North West area with a population of 55,000. Visit Sligo Abbey which is a Dominican Friary founded in 1252/3 by Maurice Fitzgerald, the Chief Justice of Ireland. It has the oldest decorated high altar in an Irish monastic church, dating to the 15th century. The beautifully carved O’Crean tomb dating to 1506 is an example of a medieval grave monument. 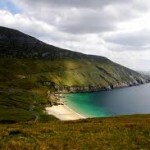 Located off the coast of County Mayo, Achill is Ireland’s largest island. It is joined to the mainland by a bridge at Achill Sound. The island measures approx. 15 miles East to West and 12 miles North to South, covering an area of approximately 60 square miles. With its Atlantic location, five Blue Flag beaches and breathtaking mountain landscape, Achill provides an unrivalled arena for outdoor activities and watersports of all types. There are two adventure and leisure centres which offer top class facilities and expert tuition in windsurfing, canoeing, sailing and many other outdoor activities. Achill’s romantic setting has also proved to be an inspirational creative retreat for artists and writers including Heinrich Boll and Grahan Greene. Fishing is a popular visitor activity whether it be deep-sea angling, shore angling or fresh-water fishing. The Achill area has some twenty pubs. Take a pint with the locals, experience the native sense of humour, enjoy local colour and conversation, hear the village sage expounding his philosophy of life, or simply sit back and take in the ambience. You are never alone in an Achill pub and never bored. Music, song and dance, pub quizzes, darts, pool and seasonal entertainment add further to the experience. Set in the Connemara mountains is Kylemore Abbey, a beautiful neo-Gothic Castle. Built by the English industrialist Mitchell Henry in 1868, visitors to the three reception rooms in the Abbey are touched by its history steeped in romance and tragedy. Kylemore Castle was sold to Benedictine nuns fleeing war-torn Belgium in 1920 and the Castle became an Abbey. The Community of Nuns re-opened their International Boarding School here and also established a day school for local girls. Mitchell Henry built the recently re-opened Neo-Gothic Church (under restoration) between 1877 and 1881 as a memorial to his wife following her untimely death. The Church, a ‘cathedral in miniature’, is a centre of reflection and prayer for many visitors. Visitors can also see the Mausoleum where the original owners are buried. Set between the Atlantic Ocean and preserved boglands, lies the town of Clifden – it is enhanced by spectacular scenery, championship golfing, horse-riding, walking, cycling, hill walking, beaches, fishing, scuba-diving, painting, national parks, abbeys, castle ruins and over 5,000 years of living history. Peruse the many shopping choices in Clifden from sweater shops, quality gift shops, boutiques to antique and souvenir shops. Lunch in tea-shops, pubs and in the evenings, indulge in Clifden’s emerging reputation as the West’s ‘Gourmet Capital’ by dining in its fine restaurants, hotels, guesthouses and B&Bs. And finish the day by enjoying a tipple in the towns many hostelries, from the genuine ‘quaint-Irish’ to the more trendy. Music is also to be found on your rounds. Enroute from Clifden to Galway city you could take ferry to visit The Aran Islands. The three Aran Islands, Inis Mor (big island), Inis Meain (middle island) and Inis Oirr (east island) are located off the coast of Galway bay. It is a place steeped in immense cultural heritage and history with Gaelic being the first language of its residents. It is considered the foothold of Irish culture. The Islands themselves are an outdoor museum of artefacts of religious and cultural importance.. It is not possible for tourists to bring their cars to the islands. Heading east from Connemara, you reach Galway, the ‘City of the Tribes’ also known as Ireland’s Cultural and festival capital. With its street entertainers and traditional pubs with great music, Galway and in particular, the Quays area of the city centre will enthrall you particularly in the evening time. Other sites in Galway include Ireland’s largest medieval parish church, the Collegiate Church of St Nicholas of Myra dating back to 1320. Christopher Columbus reputedly worshipped in this church in 1477. Also nearby are Galway Cathedral, the Spanish Arch and Eyre Square. Depart Galway and travel south towards Ballyvaughan and the Burren region. The Burren lunar like landscape is an area of limestone rock formed approx 360 million years ago and consists of imposing majestic mountains, and tranquil valleys with gently meandering streams .The Cliffs of Moher ,one of Ireland’s top visitor attractions are 214m high at the highest point and range for 8 kilometres over the Atlantic Ocean on the western seaboard of County Clare. O’Brien’s Tower stands proudly on a headland of the majestic Cliffs. From the Cliffs one can see the Aran Islands, Galway Bay, as well as The Twelve Pins, the Maum Turk Mountains in Connemara and Loop Head to the South. This evening, why not visit Dolan’s Pub, Dock Road, Limerick where there is traditional Irish Music every evening. Tralee, the bustling capital town of County Kerry, is home to the internationally renowned ‘Rose of Tralee’ festival, held every August. Tralee has great recreational facilities and a well-preserved 18th century port. 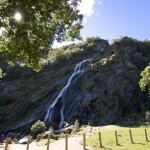 Killarney is a popular tourist destination due to its lively bars with Irish Music, good shops and restaurants. It is situated within easy reach of some of the most beautiful countryside in Ireland, with mountains, island-studded lakes and wooded glens. Muckross House is situated close to the shores of Muckross Lake, amidst the beautiful scenery of Killarney National Park. The House is a focal point within the Park and is the ideal base from which to explore its terrain. This journey will take you to Waterford via the Cork towns of Blarney, Cobh, Midleton and Youghal. A stop to climb to the Blarney Castle ramparts to ‘Kiss the Blarney Stone’, said to bestow the gift of eloquence, and is a must for those who dare. Across the village green you will find the Blarney Woolen Mills store, a one stop shop for Irish knitwear, crystal, linen and much more. From Blarney, branch south towards the village of Cobh. The Queenstown Story (also known as the Cobh Heritage Centre) is your next stop. Cobh, situated on one of the world’s largest natural harbours, was the last port of call for the ill-fated Titanic in 1912 and was the closest port to the site of the sinking of the Lusitania in 1915. The heritage centre sympathetically recounts these events and tells the story of emigration from Ireland to the United States and Australia from the time of the famine in 1847 up to the 1950s. En route to Waterford you may have time to take a stop at The Old Middleton Distillery in the town of Middleton. Irish whiskey is world renowned and its history can be traced on guided tours through any of the Irish Whiskey Visitors Centres. Some of which can be found in Middleton and Killarney. From here travel on the final leg to Waterford City and the Waterford Crystal Interpretive centre. Travelling the coastal route you will first arrive at the Dunbrody Famine ship in New Ross and then north to the Avoca Handweavers factory and tour in County Wicklow. This factory is famed worldwide for the quality of its woven fabrics. Shortly after this, you will arrive at the ancient monastic settlement at Glendalough. The monastic settlement has been a centre for pilgrims and visitors since its foundation by St. Kevin in the 6th century. On to Powerscourt House & Gardens. Surrounding this 18th Century Palladian House in the foothills of the Wicklow Mountains, you will find a sublime blend of; formal gardens, sweeping terraces, statuary and ornamental lakes together with secret hollows, rambling walks and over 200 varieties of trees and shrubs. For your final evening in Ireland, why not take in a visit to the Shindig night at the Old Jameson Distillery. Your evening begins with a drinks reception and guided tour of the distillery. Guests may also join a whiskey tasting session. This relaxed evening includes Irish music and “craic” and also contemporary “Riverdance” style dancing, paired with a delicious meal. Travel to the airport in Dublin for your return flight home.